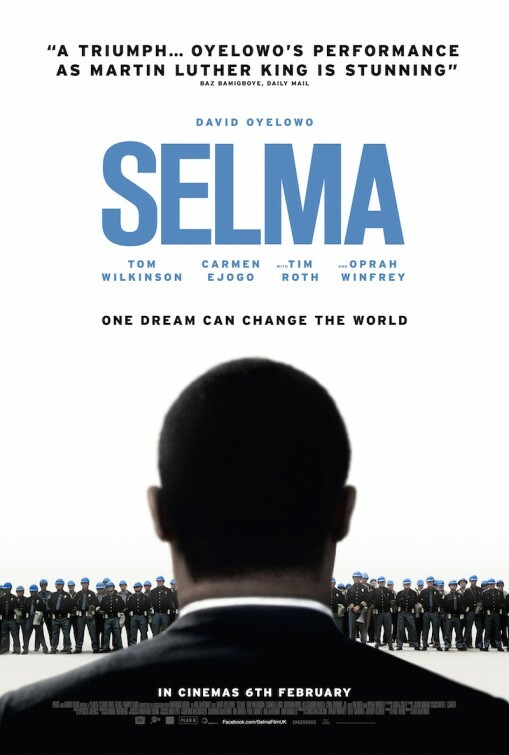 As you’ve likely heard already, Selma is a powerful film. See it. I cried a fair bit. The violence is palpable. Gunshots, people being gassed, the soggy crunch as truncheon strikes human beings, the murder of Jimmie Lee Jackson. The visceral brutality of the whites in power. Watching the film, I kept thinking Ferguson, Ferguson, FERGUSON! And all Ferguson has come to represent — not just Michael Brown, but Eric Garner, Tamir Rice, Ezell Ford, John Crawford, and all the people who have been murdered before and since. Militarized police attacking peaceful protesters: Alabama 1965 or Missouri 2014? So, when Common (who portrays James Bevel in the film) raps on his collaboration with John Legend (“Glory,” which plays at film’s end), “That’s why Rosa sat on the bus / That’s why we walk through Ferguson with our hands up,” I thought: yes. Exactly. Glad that it got an Oscar nomination for Best Picture, but how the heck does the Motion Picture Academy manage to overlook Ava DuVernay’s direction and David Oyelowo’s portrayal of Dr. King? Everyone ahead of me in line was buying tickets to American Sniper. Indeed, when the previews prior to Selma started, I was the only one in the Selma theatre. During those previews, however, five other people came. One of those five kept looking at his cell phone, so I think we can count four other attentive viewers. I don’t understand the controversy over the portrayal of LBJ. Of necessity, films will simplify. So, you’re not going to get a deeply nuanced, multi-volume Robert Caro biography here. What you get is a politician who, by the film’s conclusion, has decided to do the right thing — advocate for the Voting Rights Act, and side with Dr. King instead of Gov. Wallace. President Johnson was human; so was Dr. King. That humanity is part of what the film seeks to convey. It’s very moving. I left the theatre shaken. Great notes! I also found the FBI “notes” a powerful device to convey information while at the same time _subverting_ the “here’s what you need to know” random notes that films sometimes include but that usually have no organic connection to what’s going on (ie, a subtitle that tells you the film has switched locations, or dates). I have to see more of her films! Thanks! Yes — the FBI notes worked well, both to convey vital information and to signal the feds’ misreading of vital information. I took no notes while watching the film (wish I had! ), so was only able to convey a series of impressions here. Another impression is that the more you know about the Civil Rights Movement, the more affecting this will be. Very early in the film, when Dr. King is talking about the losses they’ve suffered, the camera moves to smiling girls, chatting as they descend a church’s stairwell. As soon as I saw that, my eyes widened and I thought oh my God this is going to be the 16th Ave. Baptist Church in Birmingham. Oh, I hope it isn’t. Then… the explosion rips through the building, and my heart sank. There were a few moments like that. Wow, I had _just_ taught a children’s novel about the church bombing in Birmingham, and it didn’t even occur to me that – in a film about the Selma marches – we were going there. I was shocked in a perfect way by that scene! Christopher Paul Curtis’s The Watsons Go to Birmingham — 1963? When I teach that novel, I bring in music, both songs from the book and contemporary political songs not in the book (such as Nina Simone’s “Mississippi Goddamn”). A live recording was released in 1964, but here’s a later version from 1968 — she often altered the lyrics to respond to current events, which in this one (below) was the assassination of Dr. King. Also, not to make you jealous (I am _totally_ trying to make you jealous! ), in November I invited Christopher Paul Curtis (you know, local author…) into the class, and he was _spectacular_!! Unfortunately, I had the exact same ticket-buying experience, as did my mom in another city. Lines and lines for American Sniper, only a few people in the theatre for Selma.